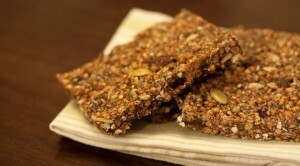 Protein bar recipe made with buckwheat, gluten-free cereal, seeds and nuts. Combine cereal, puffed grain, seeds, coconut, nuts, raisins and flax meal, and salba in a bowl. Set aside. In a saucepan over medium heat, combine honey, nut butter, molasses and cinnamon and heat until well combined. Do not allow to boil and continue stirring. Pour heated sugar mixture onto the dry ingredients until mixed through. 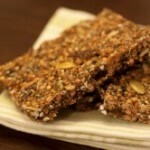 To make nut-free: replace almond with extra sesame seeds. Can use tahini or pumpkin butter in replace of nut butter.